Steve Martin once noted that "talking about music is like dancing about architecture." It's difficult to make interesting statements about music without losing hold of the essence of the art itself. It's even more difficult to do so with only the written word, without the benefit of sound. 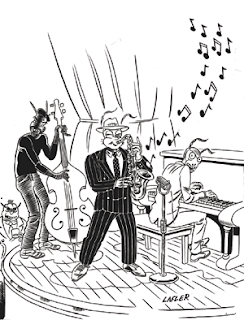 It's tempting to devolve into using musical jargon in an effort to describe the music, or to recite biographical anecdotes in order to make sense of the musician's place in their world, but both seem inadequate to the task of conveying the feel of experiencing the music as a phenomenon and getting to the heart of what it is to be a musician. 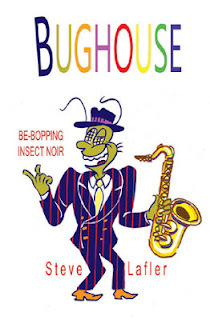 Steve Lafler is a cartoonist who manages to get at both in his series of fictional jazz comics, Bughouse, Baja and Scalawag (all from Top Shelf Productions (c 2000, 2002 and 2005, respectively). 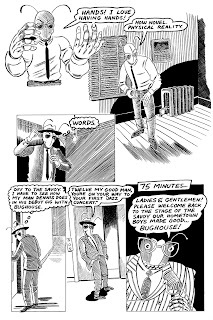 Lafler is a longtime professional who was best known for his fractured, trippy comics in his Dog Boy series and later as an editor and contributor for the Buzzard anthology. Many of his comics were completely improvised, which gave them a loose and free quality that later allowed him to effectively portray musical improvisation. The problem with some of these stories was that they meandered too much, with no plot to hold the stories together. There also wasn't much in the way of characterization, since these comics journeys were pretty much reflections of things going on in his own head. This all changed when Lafler started work on his first Bughouse short story and began publishing individual issues. When his work was picked up by Top Shelf, he received the editorial guidance needed to tighten up and organize his stories a bit more, and the results of this collaboration have been spectacular. The books are the story of sax player Jimmy Watts and the rise of his bop combo Bughouse. Lafler employs a number of devices to make this more than a straight-ahead narrative about some musicians. First off, he made the decision to draw all of the characters as anthropormorphic insects. This was a key move, because this adds a fictive layer necessary not for distancing the audience from the characters, but rather to provide a slightly fantastic context for some of Lafler's more unusual narrative moves. One might call aspects of the story magical realism, and the fact that the reader can accept the characters as bugs makes accepting other aspects of the story much easier. The second major device Lafler uses is a time and narrative fractioning. The story begins with the death of a major character, zips back to the beginning with Jimmy Watts as a child, and frequently takes side trips to the future, where we meet Jimmy's child (who has become a member of the band) and grandchild. With the audience already accustomed to expecting the unexpected, Lafler throws in visions, hallucinations, magic, time distortion, doppelgangers and other weirdness that is all firmly rooted in the narrative, yet has a profound effect on each character. Every hallucination is very real in its own way, and these jarring scenes are some of the emotional highlights of the books. One of Lafler's main themes is addiction and how creative people are often susceptible to it. Lafler creates "Bug Juice" as a stand-in for heroin or any other drug of choice that can take over lives. His treatment of drug use and drug users is cautionary but sympathetic. This is no BIRD (the Clint Eastwood film about Charlie Parker), where the central theme is a simple "drugs are bad", but rather an honest look at both the allure and pitfalls of substance abuse. All of these choices are matched with Lafler's art style, which can be described as both tight and loose. His understanding and portrayal of anatomy and motion are impeccable, but there's a loose and rubbery quality to his figures that makes the hallucinations fit right into the narrative flow. His character design is another highlight, as he manages to invest each character with their own unique look apart from being an insect. In a book where the plot is very light, Lafler succeeds in making the reader invest in each character, whatever their foibles may be. The first book begins with a look at young Jimmy Watts, who at a very young age has an advanced understanding of what he one day might become. An early theme of the book is the relationship between religion and music, as Jimmy slowly starts to evolve away from his Catholic upbringing. He does initially describe himself as an "ecstatic loonie, a bonafide Catholic subspecies...from which are drawn saints, poets and heretics". His best friend and partner-in-crime is Slim Watkins, a piano player and city boy who is Jimmy's college roommate. Slim is the cynical counterpart to Jimmy's early small-town naivete, but the two quickly understand how well they work together in every aspect of life. Jimmy has an ecstatic vision (based on a drug experience that Lafler experienced) that separates him from his need for religion, because he understands that "with music, I can unhinge time, subvert ego" of both himself and his audience. He decides he needs to start a band, because "musicians are like priests...we provide ritual" and "[create] the world from scratch every night." Hence the power of improvisation. Jimmy and Slim eventually wind up joining Buggy Eckstone's bop group, one of the most famous combos in the city. They are quickly thrown out for dabbling in bug juice, but Jimmy bounces back to form his own combo with drummer Ralph Rojas and his protege "Bones", a standup bassist. Getting high inbetween sets, Jimmy is confronted by a future version of himself who reveals that his gift is "music that speaks the language of joy without words" but also notes that he was well on his way to becoming an addict. When Lafler concentrates on the music and the characters, the book shines. When he starts to become bogged down in a melodramatic plot (there's an extended bit where Jimmy gets shot by a drug dealer, with various one-dimensional cops and low-lifes coming into the picture), the picture gets fuzzier. Fortunately, Lafler quickly turns away from such problems by simply fast-forwarding a bit to a future tour and an intriguing set of encounters between Jimmy's band and a blues group led by a thinly-disguised Muddy Waters character named McKinley. The camaraderie of a band and life on the road is the focus of the latter half of Bughouse, particularly the relationship between Jimmy and Slim and their "ongoing musical conversation." 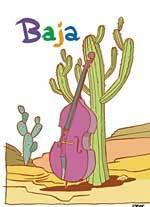 Lafler's second book, Baja, jumps ahead in time a few years. Through a series of plot contrivances, Bones is forced to hide out in Mexico to avoid a phony drug charge. Lafler was inspired by his time spent in Mexico to craft a magical realist tale about Bones falling in with a latin R&B combo and falling in love with a young woman who may or may not be a bruja (witch). Bones is not nearly as powerful a personality as his bandmates, but that very innate sweetness makes him a perfect character to react to the weirdness surrounding him--particularly in the way he's able to accept it. Lafler's third book, Scalawag, jumps back in time to Bughouse's encounter with McKinley's band, and the decisions that Ralph has to make. Normally the most level-headed member of the group, he too has to go through a series of bad decisions before righting himself. The second segment of the book focuses on Julie, Jimmy's wife, co-manager of the band and one of the driving forces of the book. An interesting side angle to Jimmy's story is the way he depends on others for his basic day-to-day survival, especially when he was an addict. The third segment of the book concentrates on Dennis, the newest member of the band, who is not what he seems. Lafler veers into some weird territory here, with angelic avatars following around the band, Julie meeting up with a deceased member of the band in some kind of afterworld library, and a doppelganger of Dennis tormenting him at every turn. There's a beautiful page where the dead band member is seen climbing away into the afterlife on a ladder of notes played by the band in his honor. Dennis' story is the weirdest of the series, as he's manipulated by a cartoonist in a town the band's playing in and is confronted by mistake after mistake as the facade he presented crumbles away. Lafler's wild visual imagination is key to making the musical sequences work. The looseness of the characters allows him to get across the frenetic soloing. For songs like "Big Cats, Dancing Cats", Lafler draws in some loony-looking felines coming out of instruments. At one point, instead of the standard musical notes emanating from Jimmy's horn, we instead see "$!?" and a cross, reflecting Jimmy's thoughts. Lafler's sense of pacing is what makes the scenes work so well. The reader is never bored or confused by the performances, but rather intrigued by what's going on in the minds of the musicians. When they deliberately and playfully try to trip each other up musically on stage, it's a reflection of that "ongoing musical conversation" that binds them together. 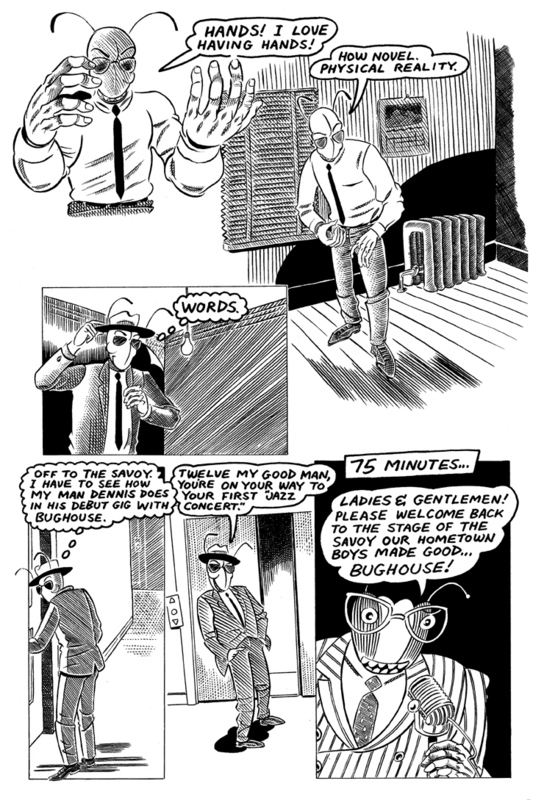 The Bughouse saga reflects an artist at the height of his own powers who has gone through the same struggles that his characters have encountered. The reader is able to empathize with the bandmates because they while they all get the warts 'n all treatment, they are handled with so much affection. At 300+ pages and counting, it's obvious that Lafler still has quite a bit more to say about his Bugtown combo, and it will be interesting to see where he goes next. Every character has had their moment in the sun, and Lafler has come close to exhausting his main themes: addiction, friendship, performance & creation and how they all interrelate. The one thread that hasn't yet been finished is how and when Jimmy Watts finally grows up, and what role his becoming a father has in this process. Hopefully Lafler can take his group in some unexpected directions.